A dummy launcher is a very useful training tool used extensively by retriever trainers. However, spaniel trainers also use this training accessory - and for more than just the long retrieve. "By launching over hedgerows and clumps of trees, your pooch will gain confidence and go past these obstructions - such as false horizons - and pin those retrieves." 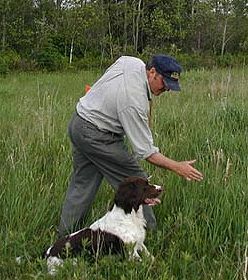 Yes, your spaniel should be able to make the long retrieves we see at field trials. But if you use a dummy launcher, vary your distances and don’t get too crazy on the super long retrieves - unless you plan to compete in strictly retriever trials. Too many long retrieves will condition your dog to go long for all retrieves and blow right by the thirty-yards or closer retrieves. When I use a dummy launcher, I like to tape two pigeon wings to the plastic dummy. I do this for two reasons. First, it shortens the distance the dummy will fly so that it won't go much farther than what a well placed shot on a strong flying bird would. Second, it will provide scent which allows your dog to easily locate the dummy. The dummy launcher gives you the ability to set up various situations that you may get into at field trials that you can’t do with live birds while training. So often we see dogs run out to the tree line at the edge of a field and not want to go the little extra distance because of that "wall". By launching over hedgerows and clumps of trees, your pooch will gain confidence and go past these obstructions - such as false horizons - and pin those retrieves. The launcher used is a converted single shot 22 cal. rifle. Another area that one should work on is gullies and draws. Our fields are not always flat as football fields and many times spaniels are required to make that retrieve on the opposite side of a lower section of land. That means going down a gully and back up the other side while keeping a line on the fall. This takes some practice with some dogs and the dummy launcher gives you the ability to set this up. 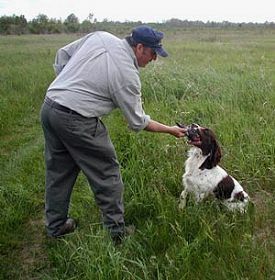 As your spaniel matures, you could make retrieves a little more difficult and start working on doubles. I must stress don’t over do this and watch your dog closely. Your dog should be able to take a line when told to do so. Start with two canvas bucks in the back yard. Sit him beside you and give him a hand thrown retrieve. As soon as you send him and his attention is on that buck, throw the other buck in the opposite direction… not far and visible. Upon his return with buck number one, put it in your vest and give him a line on buck number two. He won’t have much of an idea what you’re asking of him, but as you line him up, you will see him perk up once he sees buck number two. Send him “BACK”. Make the retrieve progressively longer, but always visible, once lined up. This is easy to do in your back yard. 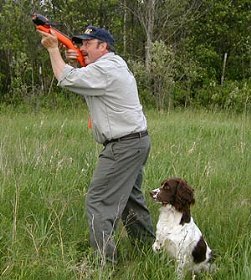 While training in the field with live birds, drop a shot bird so he sees it and walk back to the car with your dog at your heel and at a given point give him a line “BACK”. This is all confidence building and he has got to believe you that something is out there when you give the “BACK” command. This takes patience and practice. Once your dog has accomplished basic doubles, you can use a launcher and give him doubles with two dummies. Sit him beside you and give a short retrieve into a slight crossing head wind, making sure that YOU mark it well - but don’t send him. Instead, reload the launcher and give him a longer retrieve, sending him for the second dummy. Upon his return, collect the dummy then line him up for the first dummy. Send him “BACK”. The crossing head wind will assist him as he gets close to the fall. You could gradually increase the distance as your dog gains confidence in your directions. Again, I stress that this is for mature dogs. Proceed carefully with very close observation. Should you overdo this type of training, your dog may become dependent on you for directions. As you know, a spaniel must be able to mark the fall without the assistance from the handler. The dog is penalized if assistance is given on straight forward retrieves. If, for example, your dog goes out for a retrieve that is quite straight forward, makes a feeble attempt to locate the dummy then turns, looking to you for assistance, back off on the double retrieves for awhile. This is called "popping" and it is a punishable offence. For that reason, you should not work difficult retrieves on young dogs. There are, however, situations when the handler must assist the dog and his ability to take direction will score him up substantially. This is where the dummy launcher pays for itself. Set up one flag, or other type of marker, and plant one pigeon close to it. You should have a wind or this will not work. Go back to the car and get your dog and dummy launcher. Then position yourself and dog about thirty yards from the flag. You should be looking at a cross wind and launch the dummy past the plant so that the line will pass down wind of the bird. Send your dog for the retrieve. As he gets down wind of the bird on his way to the dummy, he winds the pigeon, turns into it, and flushes it - then “HUPS” as the bird flies away. Now we have a situation! Your job is to get his attention. His job is to complete the retrieve. At a field trial, you are generally given two options. Handle the dog from where he flushes the bird while you remain back with the judge, or call him in and handle him from where you are standing. Obviously one will score higher than the other, but that depends on the judge. For starters, you should walk out to the dog and give him a drink of water. This is to distract him from the flyaway bird. Then give him a line to the dummy and command “BACK”. Hint…cast him down wind of the fall. His first attempt will be to go for the flyaway bird so be ready for it - correcting him immediately and then try again. If he is headstrong, move up until the retrieve is made. It is natural for him to want that bird and if he didn’t, there is something wrong with the dog. So be patient and understanding. You are not rushed and have all the time in the world so enjoy working with your dog. You got this far and this is just another step towards perfection. You can continue working him on flyaway birds from his flushed position and gradually move up less and less until you could control him from a distance. Depending on how headstrong your dog is, you might elect to call him back to you and handle him from there. The main thing to remember is that your dog MUST complete the retrieve. Failing to do so will cost you the trial. Continued use of the dummy launcher in this scenario will pay big dividends at field trials. "Continued use of the dummy launcher in this scenario will pay big dividends at field trials." One more use for a dummy launcher is in steadying your pup. Let's say you have done your homework and pup is steady to shot. You could throw a clip wing over his head and he hups - awaiting your fetch command. So you get out training once a week with your training group but want to do extra work during the week in order to prepare him for the weekend. Go to a nearby field and stake it with some flags. You want an up wind course and at every second flag, or so, plant either a clip wing or a dead pigeon. Go back and get your pup and the dummy launcher with three to four wings taped to the dummy. As extra wings will shorten the distance, you don’t want long retrieves. I always use the yellow shots for my launcher because the lighter loads just don’t work well. Your pup will come up to the first flag or marker and wind the planted bird. After the bird is collected, cast him off again. A few casts and as the pup turns toward you, fire the dummy launcher away from the dog, but in a direction where he sees the flight line. He should sit at the sound of the shot and at the dummy flying through the air. You should be positioned so that you could intercept your pup should he decide to break. For that reason, my dummy launcher is painted florescent orange, so it is easily found if I should drop it to collect my dog. You then proceed to the next plant and repeat the process, again. When the weekend comes and you train with your group using live birds, your pup should know what to do - and so should you. A dummy launcher is a great training tool. It allows you to do a lot of work on your own without your training group. But remember, don’t get caught up in a rut. Vary the types of retrieves and gradually make things a little more challenging for your dog. Brain stimulus is very important and your spaniel will love it. Happy Training... and good luck at the trials! 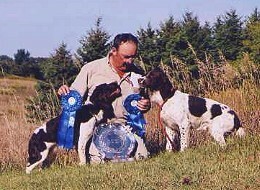 Gerald Babin has been involved with English Springer Spaniels for the past 21 years. He and his wife, Sherry, operate Grousevalley Springers. Gerry has produced four Canadian Field Trial Champions - one of which was the #2 Canadian High-point dog for 1988. He assisted in the 2001 Canadian High-point dog along with Marty Knibbs. Gerry actively hunts his Spaniels and thoroughly enjoys Field Trials. He sits on the C.K.C (Canadian Kennel Club) Spaniel Council representing Ontario North, is an accredited C.K.C. Spaniel Judge, on the board of directors of the Sudbury & District Kennel Club and is webmaster of that club's website www.sdkc.ca.